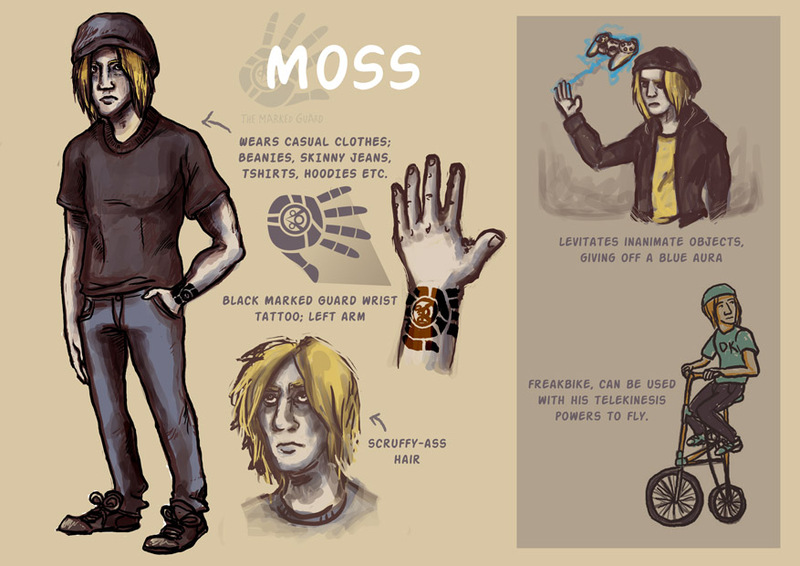 Moss was the center of attention back in high school for his super powers. He then moved to Void City to study at VCU (majoring in Ancient History), but found that he was now just like everybody else. No longer invited out to party, Moss puts his telekinesis to good use fetching the remote without having to get up, and the occasional prank on those annoying well-to-do types. Basically just an average layabout type dude. Lives week-to-week by stealing, rationalizes that it is totally okay because one day the city will owe him for his skills. He lives at the Marked Guard headquarters, or on whoever's couch. -Moss falls hard into void territory after being caught in crossfire between Jessie Valley & criminals. He is pursued wrongly for the killing by the VCPD and is rescued by Zedan and Reyak of the Marked Guard in exchange for membership. He recieves a tattoo on his wrist as a member. -Over the ensuing year Moss has become more and more jaded as he comes to realise that he can't fit in with magical politics. He is off tripping when the VOID reset occurs, and somehow survives by his powers. He meets jaded-but-for-the opposite-reasons Wizzie Belles, and they learn a bit about the humanity of the opposing side.